Created in 1997, Bourne’s Blitz Cinderella is being revived at Sadlers’ Wells. The critics had some doubts. Matthew Bourne can come across as a brilliant producer of his own weaker work. His Cinderella moves the fairytale into the London Blitz, a monochrome period world lit red by fire. The staging is stylish, from pace to tiny, witty details, but there’s little dancing, while Bourne’s characters are frustratingly undeveloped. As a producer, Bourne can use the sweep of Prokofiev’s score, but his steps don’t get anywhere near it. He struggles to fill the big soloist dances, falling back on vague and repetitive steps. The best dancing comes in the curtain calls – a burst of jitterbug that finally lets these dancers move. 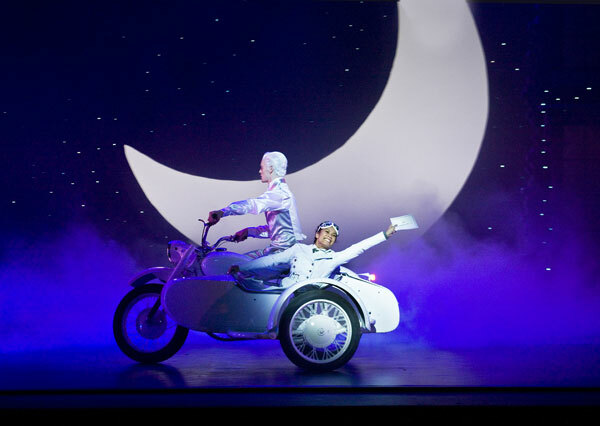 Had it not been for its design, I would award Matthew Bourne’s Cinderella one grudging star. But Lez Brotherston’s decors are so brilliantly evocative of bombed London in 1941, and of the Café de Paris, which was obliterated in March of that year, that this further star is a simple acknowledgement of his bravura as a designer. To list the tedious convolutions of plot, the rattle of predictabilities as the characters hit the stage, the reach-me-down dance manner and the hollow performances from the cast and their far from convincing dancing, is to make a preliminary catalogue of failings for this event. To suggest that the piece is less than honourable (and perhaps somewhat opportunistic) in dealing with a terrible time and a tragic event, may seem harsh. But I thought the production exhaustingly vulgar, and devoid of interest as a realisation of a great ballet score. Prokofiev deserves better. So does Cinderella. So do we. The show is based on his 1997 production, only with substantially reworked choreography, a new recording of Prokofiev’s music, and Lez Brotherston’s new sets and costumes which cleverly evoke London’s wartime privations. Less good is that some sections groan with detail. For instance, Act III tracks the pilot’s search for Cinders and includes him on the Underground, Embankment and at a sanatorium where the step-mother attempts to smother Cinderella while he has electro-convulsive therapy. This may not suit younger families. This is physical theatre in its truest sense – in-depth character portrayals and an over-emphasised mime style of movement. Sure, the spectacle of Bourne’s production values far outweighs the choreography, but these real characters with real problems have real emotional resonance with the audience.